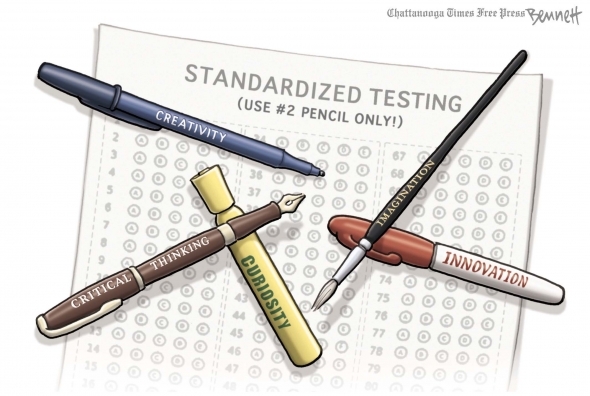 Yes, it’s still true; standardized, one-size-fits-all testing is a failure and never will meet the needs of a diverse student population. How long are we supposed to support this money-for-big-data ponzi scheme? NCLB has created a huge disconnect. When I was in school (1960’s-1970’s), we studied reading, writing, arithmetic, science, social studies, art and history. I learned each of these subjects in their own right but more importantly, I learned how they related to each other. I was taught to apply the principles of one discipline to solve problems within another discipline. I was taught how to think. Fast forward to the present. My wife is an award-winning elementary school teacher and as her devoted spouse, I get to hear about the realities of teaching. The one thing that has struck me more than anything else about her stories is the frequency of a single complaint: the amount of time that she gets to spend teaching has dropped almost in half since NCLB was enacted. I received these additional instructions recently in an e-mail. Like all of the communication that comes down the pike from our central government, this extra set of policies promises to make testing go more smoothly than ever and to ensure the best possible scores. 1. Should a severe weather situation occur during testing, please remain calm. To display any kind of anxiety would be a testing irregularity and must be reported. 2. Please do not look out the window to watch for approaching tornadoes. You must monitor the students at all times. To do otherwise would be a testing irregularity and must be reported. 3. Should students notice an approaching tornado and begin to cry, please make every effort to protect their testing materials from the flow of tears and sinus drainage.